What a difference some sun and warmth makes. Color looks much better for all plants. Yesterday I did an application of multi-mineral and today I did a drench of cal/mag, yucca and B-vitamins at a very low dose. I'm hating myself for letting the main vine on the 1415 plant getting bent. It has turned into a real nice plant that is growing quickly. 282 plant is 5 days behind it but is looking similar. Main vine is on the ground and running now. It is going to be high 80s in Denver for the next 4 days. Too warm for hoop houses. I have my hail netting draped over the hoop houses to help keep them a little cooler. Are your pumpkin leaves turning yellow, brown or do you have spots on your leaves? Is the plant wilting or have bumpy leaves or some other kind of issue? Check with the doc! The MadMan put together this great guide to help all kinds of pumpkin plant problems. 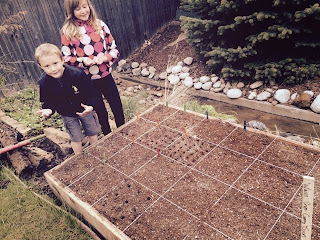 Bad weather have prevented us from getting the kids pumpkin plants in the ground for the last two weeks. To some extent it has been an advantage to have the plants under 80 degree grow lights, but these plants should have been planted 10 days ago. The seeds were started a little later than mine, but my daughter's 282 Scherber has a vine that is 2 1/2 feet long and there were a lot of roots in that pot. I'm curious to see if this plant is going to be an aggressive grower, because it seems to be stretching already. My son is growing a 1689 Daletas. It is a nice cross of two different 1495 Stelts seeds. I like the 1495 genetics. They tend to grow really big pumpkins that go very heavy and often times they are very orange. The leaves on this plant are very dark green. They put mykos, Root Shield, Azos, humic acid, fulvic acid, liquid seaweed and some RAW B-vitamins (learn more) to help reduce transplant shock. In my daughter's planting hole we also put a fertilizer pack that Ron Wallace gave to me. We will hope for the best for both of their plants. 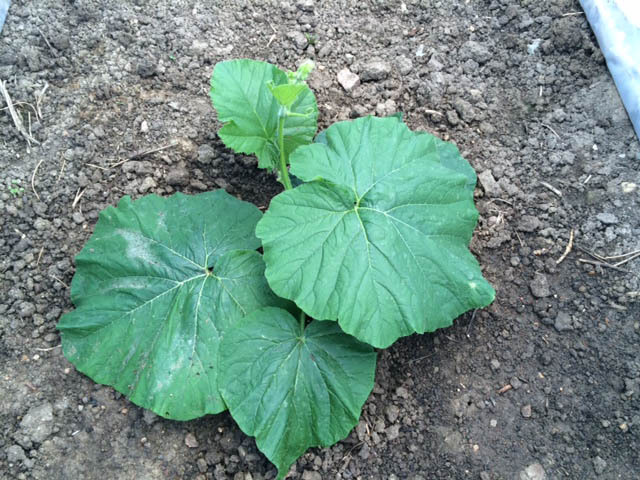 If you bury your pumpkin vines a root will grow out of the top and bottom of the vine at each leaf node. You can easily add hundreds of pounds to your pumpkins by covering the vines with dirt. It will also help the plan in the wind and help protect the vines on hot days. Today I was burying the vines on my 1985 and 1415 plants. Found something bad on the 1415 plant however. The main vine is kinked a little. I worried about that in the cool weather we had last week. The vine was dangling in the air because it hadn't laid down yet. I had put a bamboo shoot under it to support it some, but what I did wasn't enough. I'm probably going to have to go with the 282 plant now. The pipes will be kinked in that 1415 plant which will probably restrict the flow of nutrients in the plant and I don't want that. The 1415 plant is about 5-7 days ahead of the 282 because it was germinated a week earlier and it has slightly better color. I was planning on pulling the 282 this week, but this is why you grow a backup in the same hoop house. I went out of town on Friday and got back today. Plants are looking better, but a bit off color still. A little sun today and a few days of sunny weather to come should help with that. Both the 1415 and the 1985 plants have their vines on the ground now and are just over 3 feet long now. At this point I would have liked to see the vines about a foot longer, but a month of no sun and cool weather has slowed things down. Today I gave the plants a little foliar fish to help push it a long a little. Also did a drench of Biotamax, Actinovate with iron and Myco Grow. Next week we will add some nitrogen to the mix to start pushing those vines along. It has been interesting to watch the plants in the yard. At the end of April we were about 2 week ahead of schedule in plant growth. We are now about 3-5 days behind because of the weather in May. I'm guessing that when thing warm up everything is going to explode. Pictured below are the plants. Yellowing pumpkin leaves is a somewhat common problem that can have lots of causes. 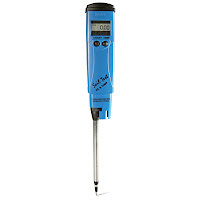 Nutrient deficiency, lack of sun, disease and over watering are the most common issues. Trouble shooting the issue can be a challenge. 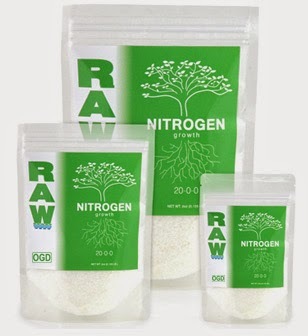 Nutrient deficiencies are going to be typically one of three things: nitrogen, magnesium or iron. A nitrogen deficiency will typically show up as overall yellowing of the plant with slow growth. An iron deficiency will typically have yellowing leaves that start at the top of the plant. A magnesium deficiency will start with yellowing leaves on the bottom of the plant. To fix this, a foliar application with some fulvic acid (learn more) or humic acid (learn more) will typically solve the issue. However, you have to look at factors that are driving the issue as well. Over watering can cause issues with nutrient uptake, so if that is what is causing the deficiency then decrease watering. Lack of sun light can also cause similar issues because the plant can use the nutrients it has to do photosynthesis. This morning I went out to the hoop houses to give the plants water with kelp (learn more) and fulvic acid in it. The plants have been a bit yellow for weeks because we've had almost no sun for the entire month of May. This morning I could see however that the situation had become worse. As you can see the bottom leaves are very yellow on the 1415 and 282 plants. So after doing the drench on all of the plants I did a foliar application of epsom salts and multi-mineral with some humic acid in it. I'm really, really looking forward to some sunny days, because if we don't start getting some sun I think I'm going to be having some real problems. When I was on the south shore of Maui last year, near the base of volcano I realized that I might have found an ideal growing area. 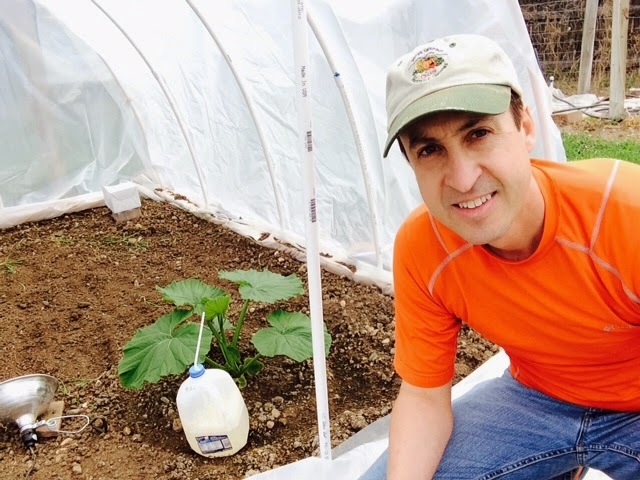 Moderate rain, volcanic rich soils and 84 degrees, year around could be a place that a world record pumpkin could be grown. It is no wonder that Monsanto is all over the island. Denver is no Maui, Rhode Island, Ohio or Napa Valley when it comes to pumpkin growing. Cool springs, warmer than ideal summer days and cool nights with low humidity make pumpkin growing challenging. Colorado has its obvious plus sides however, so I'm staying. When it comes to the pumpkins however, you have to make them think they are in Maui. This is somewhat easier to do in the Spring, when the pumpkins are in protected hoop houses. With heat sources at night, the hoop houses stay a minimum of 5 degrees warmer than the outside temperatures, humidity is higher and on a sunny 65 degree day it is easy to have a hoop house at a perfect 85 degrees with a perfectly happy plant. You've heard me moan about the weather in Colorado this spring. Very little sun and cool every day for almost three weeks now and it doesn't look like this trend is going to break until maybe next week. So you make the best of it. As you can see in the picture at the right I have a full spectrum CFL bulb in a brooder to add some additional light on cloudy days like today. Also, have a heat lamp going to keep it a touch warmer inside. Trying to make these plants think they are in Maui. We aren't quite there yet, but getting a little closer. To encourage a little more vining on my pumpkin plants I gave them a little RAW Cal/Mag this evening. Growing has been okay, but with less than desirable weather, I decided to try to push them along a little more. Today I gave the plants some compost tea with a little Actinovate, Azos and Myco Grow added to the very end of the brew. Actually I gave the plants very little of the tea and most of it watered the rest of the hoop house. I think with the cooler temperatures and the higher organic matter in the soil I've been over watering a touch so I'm cutting back. However I want to keep all of the soil moist in the hoop house to get the roots to extend, so I water everything regularly. Plants leaves have been a touch yellow because of the lack of sun over the last two weeks. I gave the plants a touch of foliar multi-mineral to help with the photosynthesis. Also put a grow light in each hoop house. Let me give a shout out to the Urban Farm Co based in Boulder and covering all of metro Denver. If you want a great garden but don't have a lot of time, these are the guys to call. My wife was asked to do an article for them and unbenounced to me had arranged for them to setup a planter box and soil for the garden. I'll have to admit and it may be a surprise, I don't spend a lot of time in the garden. Would rather spend it in the pumpkin patch. When Amber told me what was going on, I felt my toes were being stepped on more than a little bit however. I wasn't going to have some no nothing guy with a few bags of worthless "garden soil" with chunks of wood in it set up my garden! To my surprise, my experience with Bryant was exactly the opposite of what I expected. He was my equal and very knowledgeable. He pretty much setup the garden exactly the way I would have done it. I think we talked soils and soil testing for over an hour, bouncing ideas off of each other. The special blend of soil he put into my garden looks to be close to ideal and he spent the time showing my wife and kids just what to do. 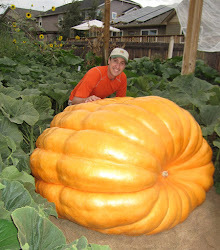 If you need a garden setup or consulting on how to improve your existing garden, visit them at urbanfarmcolorado.com and tell them The Pumpkin Man sent you. I'm trying something different this year. In the past I've given almost no fertilizers, other than a little liquid seaweed at planting time, for the first five weeks after germination. A very good grower once gave me that tip and I've stuck with it until this year. I'm now adding very small doses of specific fertilizers at specific times for specific results. In addition to liquid seaweed at planting time I've started using a B-vitamin fertilizer. This helps reduce transplant shock and helps the plant's resistance. This was proven in a good study in the last few years. The other thing I've added to the mix is monoammonium phosphate, which I gave to the plants today. I'm using the RAW brand of phosphorous which is the purest form of momoammonium phosphate you can buy. It is 9-61-0. I'm using only between 1/8 to 1/16 of a tsp on each plant. You don't need much. This form of phosphorous has been proven in a study to increase root mass by 20% when used in the first three weeks of growth. Phosphorous is the power source of plant growth and early in the season you want to focus on growing roots. In about two weeks we are going to change that focus to growing vines, but right now the roots of the plant are what we want to grow the most. In addition to phosphorous, I added in some fulvic acid and yucca. Everything was mixed in with some compost tea that I started brewing yesterday. The fulvic acid is a natural chelator which will help the plant get at nutrients in the soil. The yucca is a wetting agent that helps water and nutrients penetrate more evenly and deeper into the soil. Some studies have found greater root mass when yucca is applied to the soil. Some have suggested that something in the yucca is causing that, but I think what will eventually be found is that water is being spread into the soil more evenly with the yucca being applied so the roots extend into more areas of the soil and the end result is a great root mass. I just returned home. Spots of snow are still piled up around the edge of the hoop houses. I guess about 4 inches of snow fell last night, into this morning. I was out of town, but knew it was coming and had prepared. Plants seemed happy enough. The hoop house was 60 degrees at 6:00 this evening under cloudy skies and a bit of rain. I covered both hoop houses with a tarp to help hold in the warmth a little better. I could see the plants had grown a little in absence, but are still wanting for sun. The good news is that after Tuesday, warmer temperatures are in the forecast. 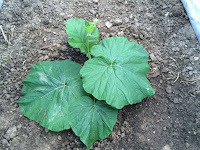 The 282 Scherber pumpkin plant germinated a week later than the other plants that I planted a week ago. However, it came on strong under the lights and it was time to get it into the ground. The root system on this 282 was very impressive. Even better than the 1415 and 1985. We will see how it will do. It is planted with the 1415 which early on was a fast grower, but it hasn't kept pace with the 1985 since being planted. Both the 1985 and 1415's color doesn't look great. It has been cloudy and rainy every day in Denver since the plants went into the ground and the weather is going to be the same and maybe even a little cooler for the next three days. Yesterday the sun came out for about 45 minutes. The plants didn't know what to do with it. It will be interesting what happens when things really heat up. 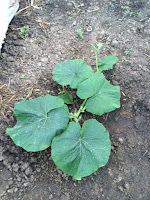 I've kicked around the idea of adding some of the pumpkin growing products that I use to this website for a few years. I am the owner of a Denver website design business (pixoinc.com) and that leaves me only with verily enough time to grow my pumpkins and I didn't want to take on the added responsibility. But then it hit me. I've got two pumpkin growing children who could use this opportunity, so we are going to be adding a full lineup of great products under the 'Order Pumpkin Growing Products' tab of this site. Like I've said in the past, there is a lot of stuff on the market today that isn't worth much to a giant pumpkin grower or gardener. So what I will be listing are quality products that I have experience with that I think can help you grow bigger and maybe save you a little money at the same time. Watch this site for more details. Today I watered both of my plants with compost tea that was made mostly from alfalfa pellets. Alfalfa contains triacontanol which is a growth hormone for plants that can help stimulate root growth. At this point of the season you want to focus on root growth. Leaf growth is fun to watch this time of the year, but it is the roots that are going to power the pumpkin, so ideally the plant shouldn't be growing a lot of salad which will be powered by nitrogen, but lots of roots. In the compost tea at the very end of the brew I added 1/8 of a Biotamax tablet. I water the entire area in the hoop house with it in the hopes of getting a lot of friendly bacteria and fungi going that will help to feed and protect the plants.